Trying to keep track of the Byzantine mechinations of the Huntsville City School Board is like playing a really unfun game of whack-a-mole. You think you’ve figured out what they are up to, and then another mess rears its ratty head. During their July 7, 2011, meeting, they discussed stiffer penalties for misbehaving on the bus. I covered it here. Last night, July 21, Alta Morrison moved to pass the new policy and was seconded by Laurie McCaulley (who had had some reservations about it on the 7th). Jennie Robinson and Topper Birney were present; David Blair was not, but he was there on the 7th. Or at least it seemed then as if they were passing the same new policy on the 21st that they had discussed on the 7th. It sure would be a lot easier to keep track of things if they could publish the policies under consideration on their website before, during, and after their adoption. The new rules are similar for all students, including elementary-age children, and include suspension of bus privileges for serious infractions. For the first violation of the rules, the penalty is a written warning for minor offenses and a three-day suspension for more serious ones. A second violation results in automatic suspension for at least two days for elementary students. Middle and high school students will be suspended for a minimum of 10 days. As the number of infractions increases, so does the number of days a student is suspended. Elementary students are suspended for the remainder of the year after five infractions. For older students, however, that punishment comes after just the third offense. So, I think, there they are at last, the mysterious Bus Rules that were discussed during the last two regularly scheduled Board meetings. But things are never straightforward with this Board. I was looking for something else, when I came across page 27 of the Student-Parent Handbook for 2011-2012. What have we here? It’s an even stricter set of Bus Rules. So my best guess is, this was the one discussed July 7 and the one in the Times is the one approved July 21. Anyone see what the problem is? It gets worse. 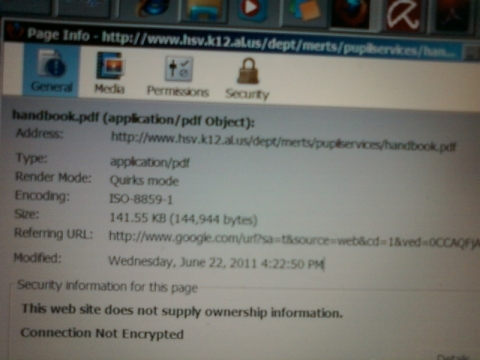 The Student-Parent Handbook for 2011-2012 I accessed this afternoon, July 22, was last modified Wednesday, June 22, 2011 4:22:50 PM. How do I know? If it hasn’t been newly modified by the time I post this (and I took a picture, just in case), you can see for yourself. Now go up to your toolbar. In Mozilla you see File, Edit…Tools, Help. Click Tools. See where it says Page Info? Click there, and you will find the web link above, and Modified: Wednesday, June 22, 2011 4:22:50 PM. The important point is that the Board had already decided it was going to have a new policy no fewer than 15 days before the “Bus Rules” item was brought forward for discussion by the Board at the July 7 meeting. I’m being generous, and calling the agenda items half-shams since, if the Times set is the one approved last night, some action was taken after the Agenda item Bus Rules first surfaced. This entry was posted in Board Meeting Reports and tagged agenda 7/7/2011 7/21/2011., Alta Morrison, bus rules, Casey Wardynski, David Blair, Huntsville City Schools, Jennie Robinson, Laurie McCaulley, School Board, Student-Parent Handbook 2011-2012, Topper Birney. by Laurie Frost. Bookmark the permalink.